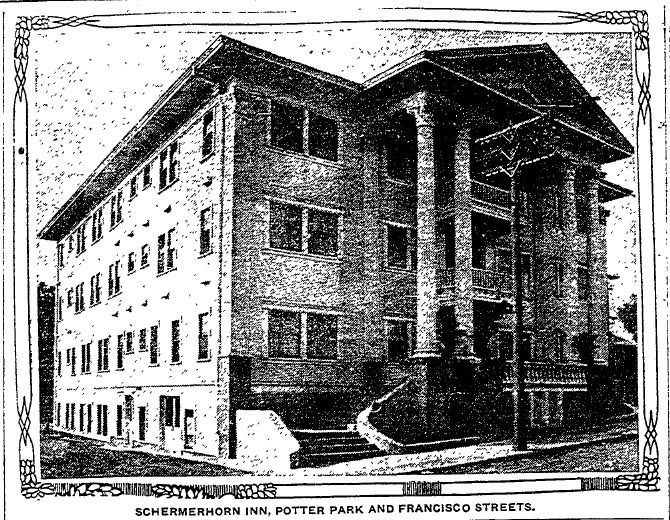 Above, a vanished landmark: The Schermerhorn Inn, at Potter Park, a street that has disappeared. West 12th Street between Main and Hoover is maddeningly crooked, but how to fix it? One set of residents has agreed to cut the boulevard through front yards because having the street as straight as an engineer’s ruler will raise property values. The other set says that homes will be ruined and that residents will be assessed too much to pay for the work. Those in favor of the improvement include W.H. O’Melveny (hm. Isn’t that a familiar name?) while opposition is led by Mr. Kincaid, the developer of the Kincaid Tract. “When the matter was brought up before the City Council several weeks ago, there was a merry tussle, but the side favoring the proposition won out,” The Times says. Alas, city planners in 1907 failed to anticipate a large sports arena blocking traffic.